The Ukrainian-built Dnepr launch vehicle lifted off on Tuesday, launching from an underground silo at a military base near Yasny, Russia at 14:42 GMT. Riding onboard is PRISMA, two satellites – nicknamed Mango and Tango – which will test rendezvous and formation flying in space, along with a French satellite, called Picard, riding below its Swedish partners. Dnepr is a converted SS-18 intercontinental ballistic missile. Most of the SS-18 missiles, the most powerful weapon in the Soviet arsenal, were decommissioned under the terms of the Strategic Arms Reduction Treaty, but could be adapted for civil use. In 1997, Russia and Ukraine formed the International Space Company Kosmotras to convert the missiles into Dnepr launch vehicles. Dnepr is a three-stage vehicle. The first and second stages are original SS-18 stages, used without any modification. The third stage is a modified standard SS-18 third stage equipped with a liquid propellant, two-mode propulsion unit that operates based on a ‘drag’ scheme in which it flies backwards, dragging the satellite behind it to ensure the most accurate orbit injection. The overall length is 34 m, and the overall diameter is 3 m. The lift-off mass of the rocket is 211 t. It is launched from a silo, being expelled like a mortar round with a charge of black powder, before the main engine ignition some 30 m above the ground. Over 30 commercial satellites have been launched by Dnepr. Kosmotras also provides the launch services. 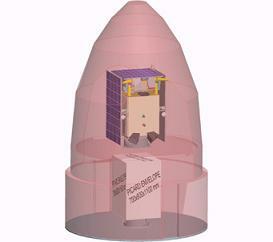 The PRISMA spacecraft design has been under development since 2005. The Mango and Tango satellites are fundamentally different, with the Mango spacecraft weighing in at 140 kg, contains three propulsion systems; a standard hydrazine system and the two experiment systems (HPGP and micro propulsion). Mango is three axis control stabilized using reaction wheels and star cameras, and also contains the VBS system with it’s two additional camera heads. Mango also communicates with the ground. The Tango spacecraft weighs about 40 kg and shall act mainly as a target object for the Mango spacecraft and contains only simplified three axis attitude control based on magnetic control, with no translational capacity. Tango is equipped with a GPS receiver which can transmit the GPS data to the Mango spacecraft via an Intersatellite Link (ISL). It also contains one of the FFRF units in order to perform the FFRF experiments. Although Mango and Tango are very different, the avionics is to a large extent identical. Both spacecraft have the same processor board and internal communication architecture, and many of the interface electronics boards are identical. As noted, a highlighted element of the PRISMA mission relates to the ESA-driven project of finding an alternative propulsion source to the dangerous hydrazine for the thruster systems. ESA has been working with a company called ECAPS, part of the Swedish Space Corporation Group, to build and test a thruster that runs on a safer, more environmentally friendly fuel. Officially called LMP-103S for the HPGP thruster, this new fuel is a blend of ammonium dinitramide (ADN) with water, methanol and ammonia. ESA and the Swedish Space Corporation have been researching storable ADN-based liquid mono-propellants through a series of contracts since 1997. “ADN has a 30 percent better performance than hydrazine, and is much less toxic,” noted Mark Ford, Head of ESA’s Propulsion Engineering section. “Unlike hydrazine it is safe to transport by aircraft and can be worked with in shirt sleeves rather than protective suits. “No energetic rocket fuel is ever going to be as benign as water, and we’re clearly not about to suddenly replace hydrazine completely but we hope to eventually provide industry with an acceptable alternative. ESA has supported the HPGP thruster through a project in its General Support Technology Programme (GSTP), which aims to turn promising laboratory prototypes into flight-ready hardware. A follow-up GSTP project beginning later this year will qualify the new hardware in parallel to its flight aboard Prisma. 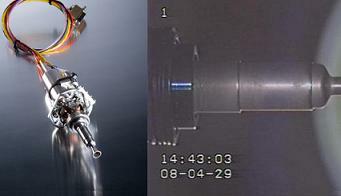 The new thruster is also being considered for ESA’s formation flying test mission, Proba-3. And flying in formation is the key element to the PRISMA mission, with the demonstration of different sensor technologies and guidance/navigation strategies for rendezvous and formation flying in space. The main satellite, Mango, is equipped with several sensor systems for Formation flying (FF) and Rendezvous purposes such as GPS, a vision based camera (VBS) and a radio frequency based navigation instrument (FFRF). Together with advanced Guidance, navigation and Control algorithms, several high level demonstrations shall be performed. The satellites are being launched into a sun-synchronous orbit at 700 km altitude, with a mission duration of approximately 10 months. The PICARD mission is an investigation dedicated to the simultaneous measurement of the absolute total and spectral solar irradiance, the diameter and solar shape, and to the Sun’s interior probing by the helioseismology method. These measurements obtained all along the mission will allow to study their variations as a function of the solar activity. The PICARD mission was named after the French astronomer of the XVIIth century Jean Picard (1620-1682) who achieved the first accurate measurements of the solar diameter. The PICARD payload is composed of the SOVAP SOlar VAriability PICARD: composed of a differential absolute radiometer and a bolometric sensor to measure the total solar irradiance (previously called solar constant). PREMOS PREcision MOnitor Sensor is a set of three photometers to study the ozone formation and destruction, and to perform helioseismologic observations, and an absolute differential radiometer to measure the total solar irradiance. A SODISM SOlar Diameter Imager and Surface Mapper, an imaging telescope accurately pointed and a CCD which allows to measure the solar diameter and shape with an accuracy of a few milliarc second, and to perform helioseismologic observations to probe the solar interior, is also included.